It’s the unofficial start of summer. For many, it’s the first three-day weekend of the summer season. Stores have big sales to mark the occasion. And towns across America have parades and remembrances to mark Memorial Day. As with many holidays, we often forget the reason for the observation. Memorial Day was originally called Decoration Day, a day when people would decorate the graves of fallen soldiers with flowers. The custom dates back to the years following the Civil War. The date May 30 was chosen to avoid commemorating a specific battle, and to help ensure that flowers planted wouldn’t get frostbitten in the northern states. In 1971, an act of Congress shifted the official observance to the last Monday in May (and this year, that rolled around on the traditional May 30 date). The red poppy has come to signify remembrance of our fallen military personnel. The custom was started in 1915 by professor and humanitarian Moina Michael who, inspired by mention of poppies in the John McCrae poem In Flanders Fields, conceived the notion that poppies, as mentioned in the poem, could be worn to honor those who gave their lives. Seven years later, the Veterans of Foreign Wars began distributing “Buddy” poppies made by disabled veterans as a reminder to all of the sacrifices necessary to protect our freedom. That custom continues today. 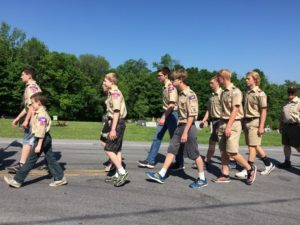 Scouts have been taking part in Memorial Day observations since the inception of our movement. There are many ways that our Scouts and their packs and troops mark the holiday. 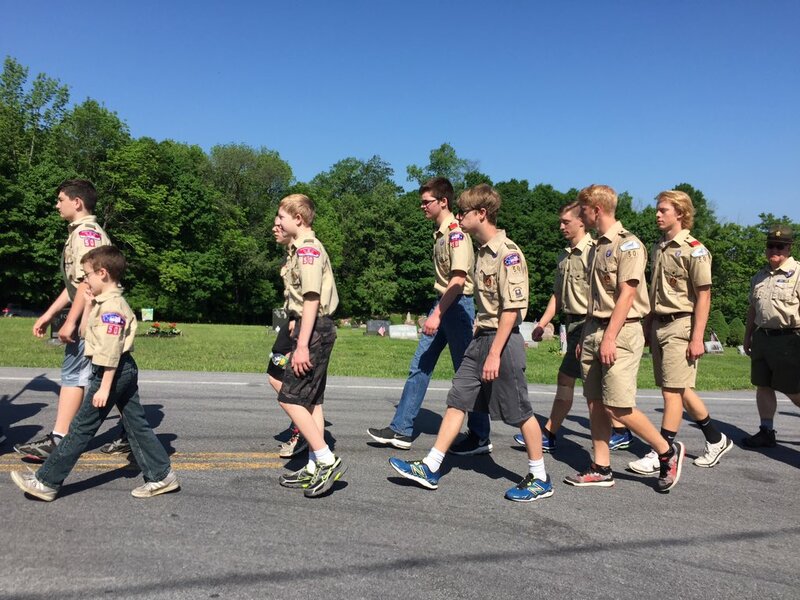 You’ll find Scouts marching in just about every Memorial Day parade. It’s a great way for young people to learn about the day, our military heroes and their place in the history of our nation. Scouts lead the flag ceremony at memorial observations in towns far and wide. Troops and packs place US flags on the graves of veterans in cemeteries, both civilian and military. It’s as ubiquitous as Scouts selling popcorn. The Utah National Parks Council, among others, team up with wholesale florist distributors who donate thousands of roses, and Scouts place them on gravestones in military cemeteries across the country. One troop serves breakfast for the veterans of their community. Another provides a community service by collecting worn US flags for a dignified retirement. Duty to country is one of our values. 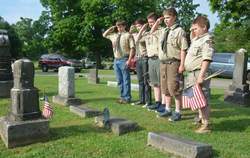 Through observation of Memorial Day, Scouts have an opportunity to lift that phrase out of our Oath and bring it to life by being of service. What did your troop or pack do to mark the occasion? Leave a comment below and let everyone know.